Learning Center classrooms, labs and libraries offer spectacular views of the surrounding landscape and provide excellent conference space and meeting accommodations. The spirit of the campus is one of refined, understated natural beauty. Throughout the interior and outside spaces of our LEED Silver Certified venue, the natural world and striking landscape of the North Cascades are close and accessible. Snow-capped peaks tower overhead, ravens circle in the sky and a rich diversity of plants and wildlife are just outside the door. Three classrooms provide flexible meeting space for up to 50 people. They include tables, chairs, whiteboards and Internet connection. Three outdoor teaching shelters, nestled in wooded settings along accessible trails, provide settings for break out sessions and small group work. An outdoor amphitheater offers a larger gathering space for guests or can serve as a more intimate location for storytelling over a campfire. The Wild Ginger Library provides an informal gathering space that's perfect for reading and reflection. A dramatic handcrafted conference table provides seating for 12 people. Salmonberry Dining Hall serves delectable meals featuring regional foods, served buffet style, overlooking Diablo Lake. This historic gathering place seats 88 and offers an outdoor deck, A/V equipment and a fireplace. There are three European-style lodges— Fir, Cedar and Pine —with guest rooms and shared gender-specific bathrooms with private showers. We offer private, double, triple and quad occupancy rooms. Bedrooms also include wireless Internet, writing desks and built-in wardrobes. Two lodges have a lounge area with sofas, chairs, fireplace and a limited kitchenette — perfect for relaxing and late night conversations. Linens (pillow, sheets, blanket and towels) are supplied. 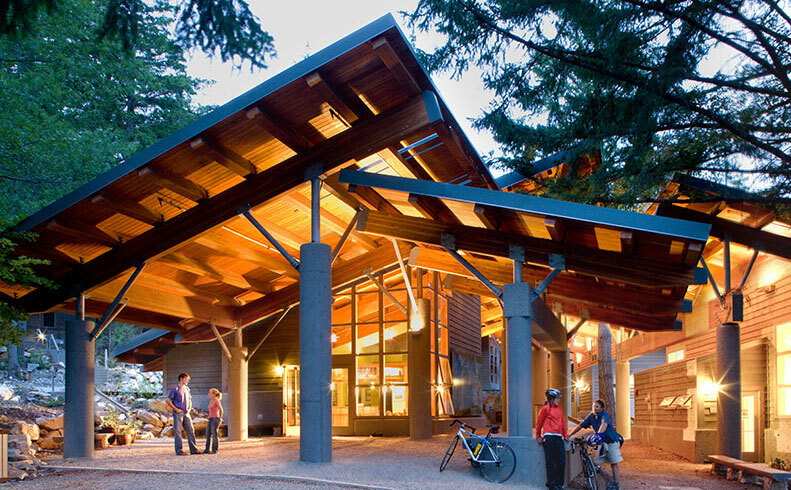 North Cascades Environmental Learning Center is an intimate, comfortable setting that accommodates people with a wide range of interests and physical abilities. Lodges, public areas and most trails are wheelchair accessible.